lets talk ppppffffttttt ! err.... pop! they started life at .452"
i have it on my desk. i heard it go POP and i heard it smack the target SLOW! it fell right back in the case when i brushed it off. im betting that that powder (im sure 1/2 gr or something tiny) was the only powder that ignited in those pppffftt rounds. so we had to have a bit of powder helping out. Re: lets talk ppppffffttttt ! err.... pop! The problem with this thread is we all kind of ran down the rabbit hole thinking this was all related to bullseye shooting till you told us it wasn't and you were not interested in bullseye shooting. 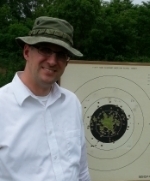 A Forum dedicated to the sport of Bullseye shooting. Therefore we expect all posts to be related to the pursuant of the sport in some form or fashion. Light loads are of some interest to shooters but only if their accuracy can be stated, and the new painted bullets have yet to have anyone post as to their accuracy which is a question that has been asked but not answered as of yet. I had hoped you would provide us with some of those answers but I guess not. I see no need to delete the topic but it would be nice if any further info could be more related to accuracy and our sport that just about bullets that go bang or not. but arent you the least bit interested? I'm locking this thread. This was a big waste of time. There are way too many variables here to figure out why this 1 batch of Guncheese's ammo didn't light properly....we are done here.